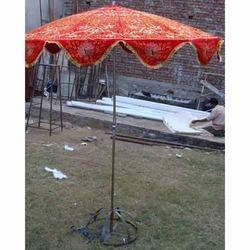 Description : This handcrafted tent is made available in various specifications to meet the exact demands of our patrons. Moreover, the small poles, at equal intervals, are used at the edges of these tents. We made free standing and floor mounted umbrellas. They ate available in 2.25m Dia, 2.5m Dia and 3m Dia. 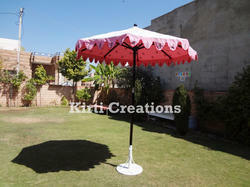 a comprehensive range of our exquisitely designed garden umbrellas is a hot selling item in the international market. Designed to perfection, these umbrellas are available in customized sizes and styles. It has a water-repellent cotton canvas with beautiful patchwork. Wooden umbrellas are known for its royal look and splendid beauty as it catches the eyes of every passer by. SIZE : 2.25' x 2.25' x 6.5' FT.
Enriched by our vast industrial experience in this business, we are involved in offering an enormous quality range of Canopy Umbrella Tent. Our Umbrella tents are handcrafted with traditional method using fine quality natural colored canvas. The interiors are adorned with exclusive prints, logos, mirror work and embroidery, which accessorizes the tents. This range is hugely popular and used in various places like resorts, restaurants, garden parties and others.